The first book that I thought of for this topic was Ich nannte ihn Krawatte by Milena Michiko Flašar, and it is about finding emotional comfort in a stranger, but it's German and hence not on the list. The ones I thought of next were all those Enid Blyton series I loved as a kid, The Famous Five and the Five Find-Outers. 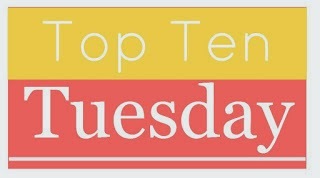 I've tried not to include books about friends who fall in love, for this week's Top Ten Tuesday, Books about Friendship topic. Because, really, while a couple who are the best of friends make a really good couple, it isn't exactly their friendship that we love. 1. Harry Potter and the Prisoner of Azkaban by J. K. Rowling - The first book is about making friends. But I like the Prisoner of Azkaban the most, because it is about sticking by the friends you've made, loyalty that lasts a lifetime and more. Sirius, James and Lupin were the best! 2. Watership Down by Richard Adams - Granted, these are rabbits not people who are friends, but it's a classic adventure, where by the end you see the band of rabbits resolve all their conflicts and stand united against all odds. If that's not friendship, I don't know what is. 3. The Book Thief by Markus Zusak - Of course this is here, this had to be here. Rudy loved her like no one else, so of course, I'm referring to Liesel and Max; I'm one of those people who don't think she ends up married to him. 4. The Ocean at the End of the Lane by Neil Gaiman - This book is for those people who like to tell kids, "You'll get it when you're grown up." As if kids aren't just smaller sized versions of people; it's amazing how most adults forget what it was like to be a child, and couldn't possibly comprehend what a child can understand. And that's the thing that makes childhood friendships unforgettable - the rare kinship. Before I spiral into a whole post about this, I've two words: Lettie Hempstock. 5. A Thousand Splendid Suns by Khaled Hosseini - Now this book really is simply and most beautifully about two friends and how their friendship lets them overcome all the struggles of their life, together. 6. The Adventures of Huckleberry Finn by Mark Twain - How could this not be about friendship? 7. Conrad's Fate by Diana Wynne Jones - My favourite in the Chrestomanci series, this book is about how fifteen-year-old Christopher Chant becomes friends with Conrad Grant and together the solve a mystery, to save both Christopher's friend Millie and Conrad himself. I just love the fun these two have, especially how Chant keeps teasing Conrad about his alias 'Grant'. 8. Never Let Me Go by Kazuo Ishiguro - I'm talking about the relationship between Ruth and Kathy & Tommy. It is rocky to start with, and eventually grows and matures as they do, and that's what makes their friendship so real. 9. The Golden Compass by Philip Pullman - I just finished reading this trilogy and I only have to say this: Lyra and Roger. A lot of wonderful selections-I love Conrad's Fate. IT is a perfect example as well. A Thousand Splendid Suns is so good! You have a lot of books I've not read on here, I know, for shame. But The Golden Compass and The Ocean at the End of the Lane are both excellent choices, it's been a while since I've read them so I didn't even think of them. Ha, I also was trying to avoid books about friends who end up falling in love, because the books end up really being about the romance, after all. It was harder than I thought! I love your entire list -- especially Never Let Me Go and The Golden Compass. Both have such different takes on friendship, but both are so powerful and creative. Becky - Of course, friendship isn't all they're about; so it took me a while to remember them too. But they do kind of fit anyway, don't they? bookshelffantasies.com - Powerful and creative - exactly! You've got some great examples there. I have a huge soft spot for Sirius Black despite him bullying Snape.